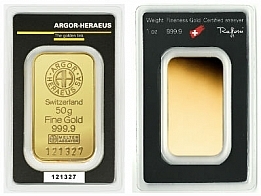 All Argor Heraeus gold bars contain 99.99% investment grade gold bullion. Each bar is sold individually sealed in its own certicard. 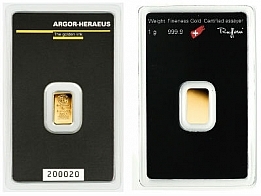 At the top of the bar is the Argor Heraeus logo, followed by the gold bar's weight, fineness and serial number. The bar's serial number is also inscribed on the certicard. 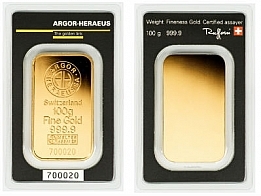 Argor Heraeus gold bars are available to gold investors in sizes ranging from 1 gram to 1 kilogram. The larger sized bars, including the 1 kilogram gold bars, are cast bars, and are not sold in certicards, due to their weight. However, they do come with a certificate. 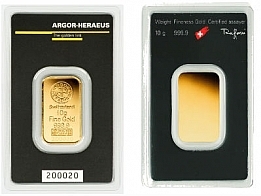 Argor Heraeus produce bullion bars for precious metals investors in gold, silver, platinum and palladium. Bars may include Heraeus, Austrian Mint or Kantonal Bank markings.